This four-day tour is a fine way to see why the Icelandic horse is so well suited to their homeland. You'll travel over mountains, into lush hidden valleys, through glacial streams with marvelous vistas of southern Iceland. Because of its short length this tour is part of our "Hors'e d'oeuvres" series - great ways to start (or end) a trip to Iceland. It comes with airfare, transfers and all the accomodations needed, and we can add on extra days, and activities that will make for a great Iceland adventure. You’ll travel over mountains, into lush hidden valleys, through glacial streams with marvelous vistas of southern Iceland. Off the horse, you’ll enjoy the pleasures of the outfitter’s very comfortable Hotel. You’ll start the day by getting to know the horses in the paddock. After an early lunch you’ll follow the old route to Hellisheidi, riding across the moor to the volcano Hengill and over the lava field Kristnitokuhraun, the agility and comfortable gaits of the Icelandic Horse is at its best. You'll ride over lava which came from the eruption of Hengill during the year 1000; the same year Iceland officially became Christian. Legend calls the eruption the revenge of the old gods Thor, Odin and Freya. You'll ride on the track between lava and hills ("milli hrauns og hlidar") down to Kolvidarholl, which has been a rest stop on the trail for centuries. The horses will stay there and you'll go back to the hotel, after a 21 km ride, lasting about 4 hours. The day starts by riding below the mountains Husmuli and Hengill. Soon you'll dismount and lead the horses through the narrow cleft to the lush grasses of Marardalur, the Valley of Horses. Then you'll ride through Dyrifjall (Door-Mountains) and at the top be rewarded with a great view over Lake Thingvallavatn. From a geological perspective this area it's quite unique, being where the North American and European continental plates are drifting apart. It's played a major role in Iceland's history, being the site where the ancient government of Iceland met for hundreds of years. Heading off the mountain, riders come down to the geothermal area at Nesjavellir and again leave the horses to rest, as you return to the hotel, after riding 30 km in 6-7 hours. The day starts with a ride up to a view of both Thingvallavatn Lake and also the mountain Skjaldbreidur, an extraordinary shaped mountain that is always capped with snow. Then it's down to the shimmering volcanic lakes at Kattatjarnir, and on to a steep path of lava leading down to the valley Reykjadalur - the Valley of Steam. Your reward for all this riding is a dip in the warm stream running through the valley - you control the temperature by moving up or down the stream! Then it's back e down to Hveragerdi where the tour ends. After saying good-bye to the horses, riders head back to Reykjavik where you'll be dropped at your hotel (another upgrade for Horses North clients). Often riders all go out to one of Reykjavik's many good restaurants for a last dinner together, (but it's not included in the price!). Accommodations on Around the Volcano tour are NOT typically Icelandic for a horse tour. Your evenings will be spent in the Hotel Eldhestar, at their farm in Hveragerdi, which is the first in Iceland to be designated at an Eco-Hotel. It features Hastens beds from Sweden, heated floors, nice bathrooms and of course, views of horses. In the evenings, you'll have presentations about Iceland's unique nature and geology, and a chance to soak in the farms hot pot. The last night of the tour is in a Hotel or guest house in Reykjavik and is included. These are Prices and travel dates, fron North America, for the tour - we can also arrange for earlier travel. *Price includes round trip airfare, including fuel surcharge and departure taxes, from *BOS. JFK, Newark, PHL Washington Dulles and Orlando. (ask about prices from Minneapolis,Denver,Anchorage, Seattle, and Toronto). 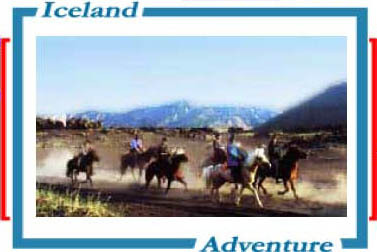 Price includes all airport transfers, post ride hotel accommodations in Reykjavik with private bath, tv, internet connection, and breakfast, a comfortable hotel room on the outfitters farm during the ride with private bath, all meals during the ride, a post night in Reykjavik, as well as safety helmets and rain gear.